Figure 1. Proposed software architecture for medical USB class. Figure 2. Application hosting device. USB is gaining popularity in the medical segment. One of the major challenges for medical designers is medical standards compliance, as Cuauhtemoc Medina Rimoldi explains. One of the strongest organisations in terms of medical devices standardisation is the Continua Health Alliance. This organisation unites smart technology and medical devices with healthcare industry leaders to empower patients to not only exchange vital information, but to change the way they manage health and wellness. The Continua Alliance is a forum consisting of 200+ member companies that have come together to form workgroups to set standards for medical systems. The organisation promoted multi-vendor device interoperability by setting standards for medical systems. When addressing USB connectivity, an important standard to consider is IEEE 11073. This provides structure to the communication interface by defining commands to access data, structuring data to be transmitted and defining communication states. Another important standard is USB itself. 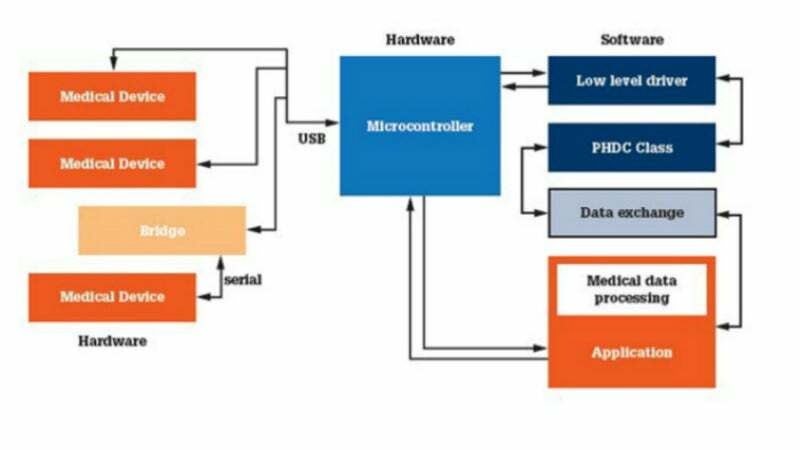 The USB organisation has defined the personal healthcare device class (PHDC), which is a standard implementation of USB communication for medical devices in the industry. These individual knowledge blocks provide the required tools for developing a particular implementation of medical USB connectivity to a specific vendor. This implementation is proposed as the communication standard in several medical applications. Standardisation: the solution is based on well-known standards in the industry. This will ensure success and proper introduction from the product to the market. Connectivity: the implementation allows connecting multiple devices from different vendors within an ecosystem topology. A connectivity friendly environment is sustained by a robust and easy-to-use software stack. Portability: multi-device independent layered architecture eases porting of code between devices. Selecting a hardware vendor with a broad portfolio is key to ensuring customisation and product roadmap establishment. Software architecture ensures code robustness, portability and reliability in embedded systems development. An architecture diagram is shown in Figure 1. Several layers of software abstraction isolate the reference application from the low-level communication drivers, permitting code-reuse and portability between devices. An application programming interface (API) consists of the functions that can be used at the device level and the class level. This enables new classes to be implemented. This architecture has four generic class implementations: mass storage device (MSD), communication device class (CDC), human interface device (HID) and PHDC. The API functions defined for these classes can be used to make applications. Notice the PHDC block in the software architecture diagram. This is the core of the proposed medical USB stack in terms of medical application operability. The software block provides the basics for medical applications to exchange data. The application usually sits on top of the stack. Based on the implementation, the application interfaces with the class driver, the low-level driver, or sometimes with the controller directly. Medical devices can play different roles in several scenarios depending on the hardware and software combinations. A portable stack will allow the adapting of software to different hardware needs with less effort. Figure 2 shows how an application hosting system might function. 1. Device: in this model the medical device connects directly to a host system and passes the measurements to the system after acquisition. 2. Bridge: in this case the device implements a bridge between the application hosting system and the medical device that acquires the measurement. The bridge device implements a low-level driver, the PHDC class and a transport shim layer that forwards the data it receives to the external connected medical device. It also sends the data received from an external medical device to the system running IEEE11073 manager. 3. Host: these devices will implement host / manager functionality. They can run on an embedded device running an RTOS and will have the ability to connect to one or more devices. 4. Hybrid: these devices will implement host / manager as well as agent / device functionality. They will initialise themselves as a manager or agent, based on the user’s choice. When they are connected to managers, they will act as agents and viceversa. These kinds of devices will use the on-the-go feature, which allows the building of manager and device functionality in the same device. The device can be used in remote areas as a manager to collect data from agents. In the future, more USB devices compliant with industry standards such as IEEE-11073 will be developed under organisations like the Continua Health Alliance. A sample application, featuring a weight scale device, has been created to demonstrate the value of working under the standardisation scheme and allowing multi-vendor device interoperability. In the weight scale example, the personal healthcare application interacts with the host computer using IEEE-11073 – 20601 and IEEE-11073 – 10415 (weight scale) protocols. It is important to note that the host computer runs the same IEEE-11073 protocols. One example of such implementation is covered by the Continua Alliance. Member companies of the Continua Alliance can obtain CESL reference software. After installing this software the host is emulated and the weight scale device can be connected. Freescale has developed a sample code to connect with the Continua Alliance emulator. After flashing an 8-bit 9S08JM device with this software the device is recognised as a Continua USB interface. The supplied drivers allow the device to be recognised as a USB personal healthcare device. The Continua manager is easily launched and transport communication starts. The weight measurements are sent from the 9S08JM device to the host. Other personal healthcare applications can also interact with the host system developed by Continua, for example: IEEE-11073 – 10407 (blood pressure monitor), IEEE-11073 – 10417 (glucose meter) and IEEE-11073 – 10408 (thermometer) protocol. This kind of enablement allows medical device vendors to gain an advantage while certifying their products with recognised industry standards such as the ones followed by the Continua Health Alliance. Freescale’s medical applications USB stack helps designers improve time to market and optimise budgets. The PHDC has been ported to several 8-bit devices and is planned to be ported to 32-bit devices in the future. Standardisation is critical, especially as new markets emerge. Being a part of big alliances with important member companies is vital to ensure interoperability and sustained development of personal medical devices. The Continua Health Alliance is a benchmark organisation in the medical device industry and provides product certifications. USB is one of the most popular connectivity interfaces today and is a preferred choice for wired connectivity within medical devices. Complying with standards such as IEEE 11073 guarantees structured communication and enables medical device designers to provide the necessary connectivity that personal medical devices require. Freescale provides the Continua-ready medical applications USB stack to ease the standardisation transition and reduce time to market for connected medical devices. Freescale is creating a smarter, better connected world. Already, there are more than 18 billion Freescale semiconductors at work all over the planet. They can be found embedded all around: in automobiles, computer networks, communications infrastructure, office buildings, factories, industrial equipment, tools, mobile phones, home appliances and consumer products that touch every aspect of daily life. Freescale sees a world where intelligence and connectivity are embedded everywhere.